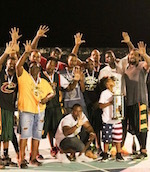 Anguilla has commenced a plan to redevelop its basketball program. Currently, the Anguilla Junior National Team is training for a regional 19-Under tournament to be held in St. Maarten, Virgin Islands, October 22-26. 25 players are practicing and twelve will be selected to play in the tournament. Other planned events, which will be reported here, include the 2004 season starting in February, and a camp and coaches clinic scheduled for the summer of 2004. Basketball talent does exist in Anguilla. Randy Javois, a 6-6 forward, is a sophomore at Clinton Community College (IA) and will be joined by Javeel Brooks and Jason Hodge this upcoming season. There are other young Anguillian players eager to develop their skills.